In a segment here at The Octopode, called “Getting in Touch”, I advocate for taking a simple step toward your preferred vocation (if you are not already engrossed in it) by getting your hands on the materials associated with that kind of craft. Just experiencing having it in your hands, being manipulated by you, opens up mental pathways and gets you moving toward your goals in that work, even if those goals are not yet defined. It’s a kind of culturing/nurturing of motivation, which I believe is paramount in any endeavor. There is an example on that page of a telephone pole I secured and hung onto until a project occurred to me for it. But the pole is really only the beginning. As the short and long term building goals for Salamander City have formed, I’ve realized the present and some of the future material needs of the project. I keep a running list on my phone. The idea is that if I know that I will need something in a couple years, until that day comes I can keep an eye out for it. When one of those things becomes available cheaper than usual, or even free, I can snag it while the snagging is good. In the long run I’ll end up saving a lot of money and avoiding delays. Even though I’ve only been working on this project for less than three years (it’s the end of 2017 as I’m writing this), the practice has really paid off. A while back I encountered someone unloading a bunch of whiskey barrels on the cheap, and snagged the full-size bourbon barrel you see to the right. It’s in great shape for having been rejected by the distillery. My guess is they discarded it due to leaking around the area of the bung (heh, I said bung), since there are a bunch of stains there. My plan is to cut a lid in the top of it, and use it indoors as a mouse-proof storage location for pillows and blankets. Toss a few red cedar chips in there too, and you won’t have to worry about moths either. But, the raw material I need out there more than any other is wood. All the structures up there are fashioned of wood and fasteners, sitting on rocks and concrete. As I described in the last segment, I try to build at the level of quality that everything else onsite was built. Though a small amount of wood is available to cull up there each year, my needs far outweigh what I can find on my small acreage. So, I troll Craigslist for free or cheap wood. Thankfully, there’s a lot of it. A fellow that sources and mills dead/felled trees popped up in my local garage sales feeds, and I paid a visit to obtain the item he was advertising at the time: four foot by four inch oak cookies. I had an idea to build a kitchen island with them. They’re still waiting as of now, since interior furniture needs won’t crop up for a few more years. When I visited his shop, I learned that he had a lot of nice slabs lying around that weren’t doing him any good. Cottonwood mostly. Stuff that no one wanted for one reason or another. Also odds and ends, broken pieces, warped ones, etc. I had no idea what to use them for, but I knew that I would need them eventually. Opportunity was knocking. For a few bills I managed to fill my pickup to the point of sagging pretty bad in the back. It was not an easy drive up into the woods. And by the time we arrived, my helper and I had to work right past dusk to get all the wood unloaded, stacked on blocks, and wrapped in tarps. Think my seventeen year old pickup likes being mistreated this way? But, it was so worth it. The haul has worked its way into several key projects up there. 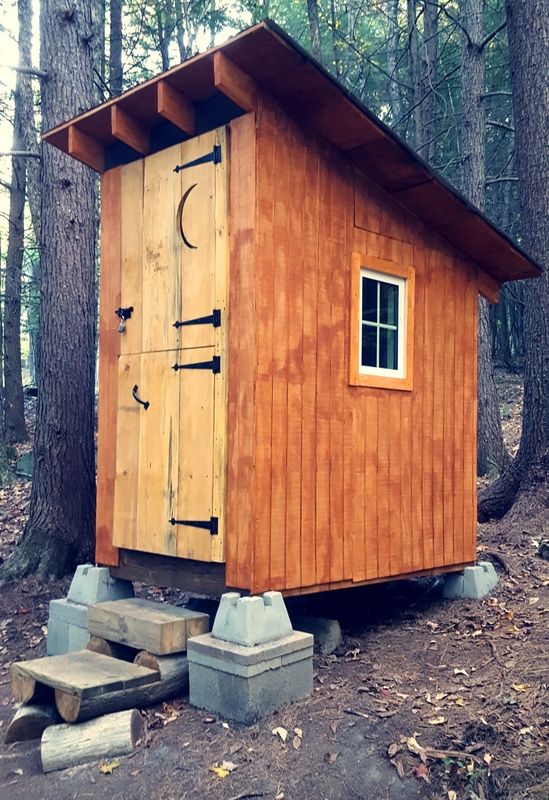 In 2016, having that wood allowed me to build a woodshed from primarily cheap, locally sourced materials. The design went through a few updates during the brainstorming stage, when I decided to include a hanging section in the back where kindling could be stacked and kept out of the weather. But the basics were even simpler than the Ploppe Shoppe: a square sill frame made from cheap dimensional lumber, attached low to the ground to pressure-treated 4x4s standing on positioned stones. I ended up only buying the 2x stock, the 4x4s, and some carriage bolts. Everything else, I had on hand. The area I wanted to use was directly behind the existing wood pile. It’s an area of soft ground where I’d pulled a bunch of crap out of the ground that prior owners had elected to dump and bury there. An old carpet, broken dishes, a ton of plastic sheeting . . . It was a mess. After I removed most of it, the area was poor for walking around on, and seemed an ideal place for the shed since it was adjacent to the fire pit and an easy walk from the porch, where wood for the wood stove will be hauled and stored. As with the benches, I started by measuring out the four spots where the feet would meet the ground. The key to getting these building footprints to be square is to not only measure the outside edges but also the diagonal ones. Make sure it’s all equal and you get a square. After digging and setting stones for the feet, I built the sill frame. The legs were going to meet the ground at different points in order to make the structure level, so I needed a level point of reference to mark the locations of the connections from leg to sill. After building the frame and getting it in place, I stacked wooden and concrete chocks on the ground beneath it in a few places until it was sitting the right height off the ground and was level. As with the benches, I used a spirit level to make sure it was correct. The slope of the ground is too easy to misjudge if you just eye it. To get the legs to aim straight upward and form the right undercarriage for the building of the roof and walls, I added cross members in both directions. For the front to back ones, I used birch that I’d felled and peeled right there on the property. Those same birches (there were two) had large, single fork branching structures near their upper ends, and I had saved them, thinking I’d find a way to use them. The woodshed ended up being the place. The thick, live-edge, damaged cottonwood slabs I had stored up there made excellent floor pieces. In a woodshed where you are drying your wood, it’s important to leave gaps in all the walls and floor so that air can circulate. The live-edge pieces were ideal, because I could leave those jagged edges on there and enjoy their appearance in addition to solving the air circulation problem. Where needed, I cut notches into the slabs to accommodate the structural members. You can see in the floor layout that I used different pieces in the front and back. This is because the slabs were uneven and in some cases too short. Since there was a planned wall between the front and back, they didn’t need to match. Additional skeleton pieces went up, including a set of rafters. The roof decking is the same ¾” larch that I’d sourced and used for the bench backs and the outhouse roof. The roof cladding is tar paper and red galvanized steel panels left over from the outhouse build. The panels came from a fellow in the area of the property who buys remnants of the rolls that the steel panels in hardware stores are cut from, that would otherwise be discarded. I love it when being resourceful goes along with being green. The forked birch branches made beautiful decorations on the outside walls. 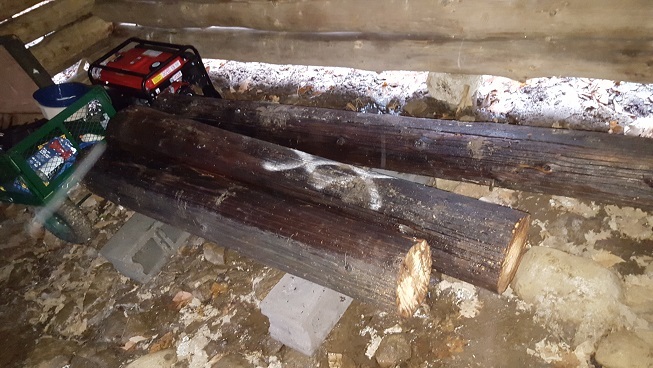 They and the cottonwood slabs were one step away from being firewood, but now, they are a part of something that will be appreciated for years to come. After a coat of stain to match the other out-buildings, the woodshed was looking great. And none too soon either. Winter was coming on and it was bitter cold up there toward the end. My helper and I had to work in snow, one day. We kept the fire pit raging for that one. Toasted homemade cinnamon rolls over the fire, and made our way home after a long day of hard work. A hot shower and a night’s rest is a highlight after a day at Salamander City. The next year I sourced some free firewood from local folks who just wanted excess logs removed from their property. After a few months stacked in the shed, I pulled the bucked logs and split them with a maul, then stacked again. Who needs the gym when you can be super manly and split wood for exercise?